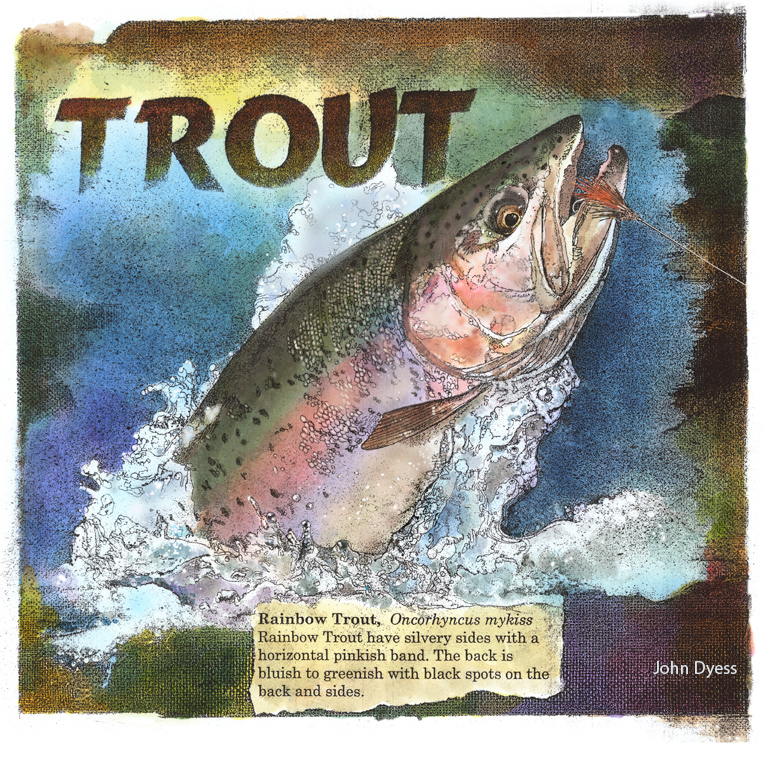 My hand colored electrostatic transfer prints of fish will be for sale during the OAGallery Third Annual MANymini Small Works show which opens November Third,6-9 p.m. This drawing of a Largemouth Bass is one of five fish drawings that will be for sale. They are framed with a white mat and brown wood frame. OA Gallery is located at 101A W. Argonne Dr. Kirkwood MO 63122 It is directly across the street from the train station. This mixed Media painting is for sale at The Queeny Art Fair August 30,31 and September 1. Recently James Ross,a recent graduate of Savannah College of Art and Design, visited my studio to look at my illustrations and paintings. He had a suggestion that I show detail views of of illustrations on my website,studiodyess.com, along with the full illustration so that viewers good see the complexity of my line drawing. 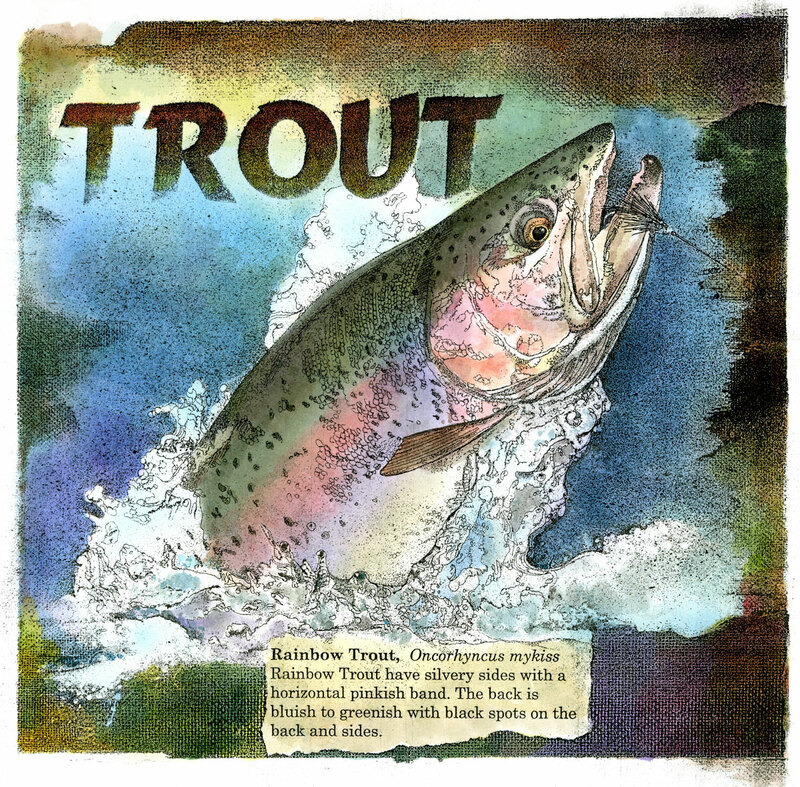 Today I am posted detail views of my Rainbow Trout ink and watercolor illustration. 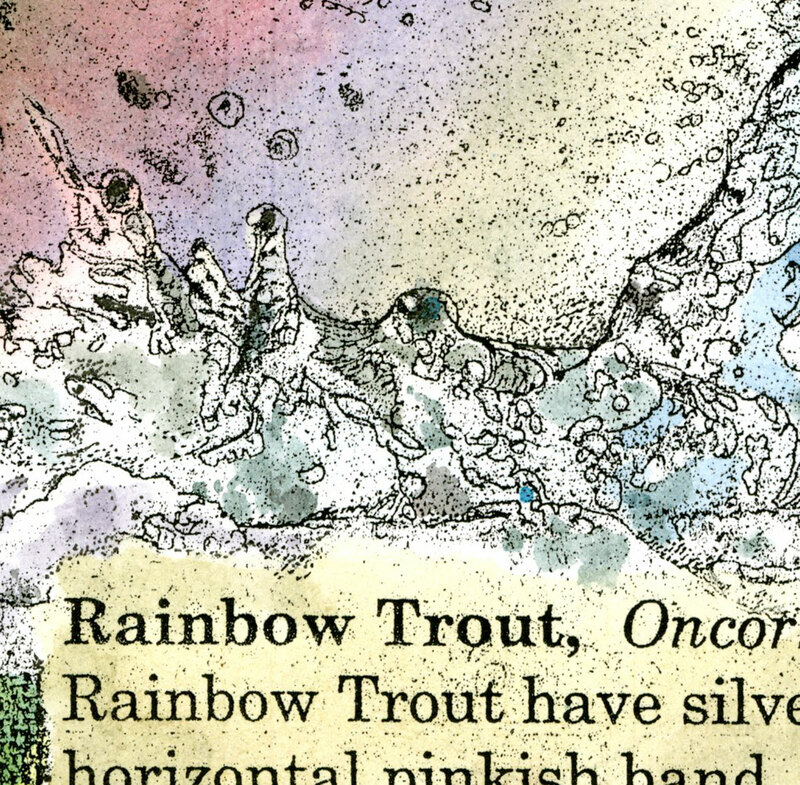 detail of water and type from my Rainbow Trout illustration. 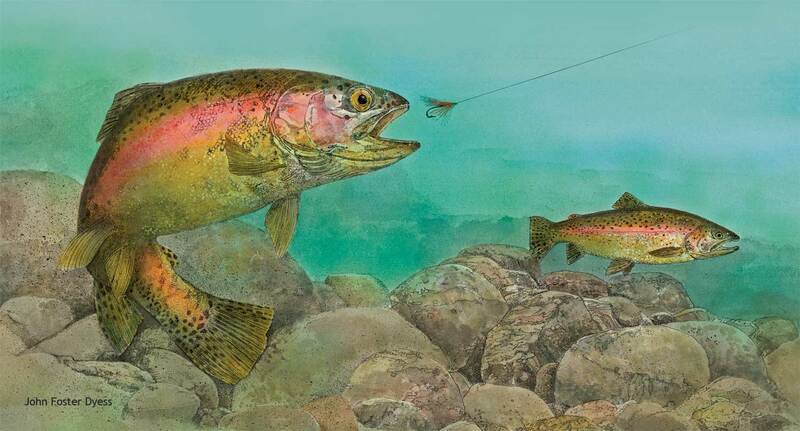 Finished illustration of a Rainbow Trout leaping out of the water. Size of this illustration is 10″ wide x 10.5″ high. 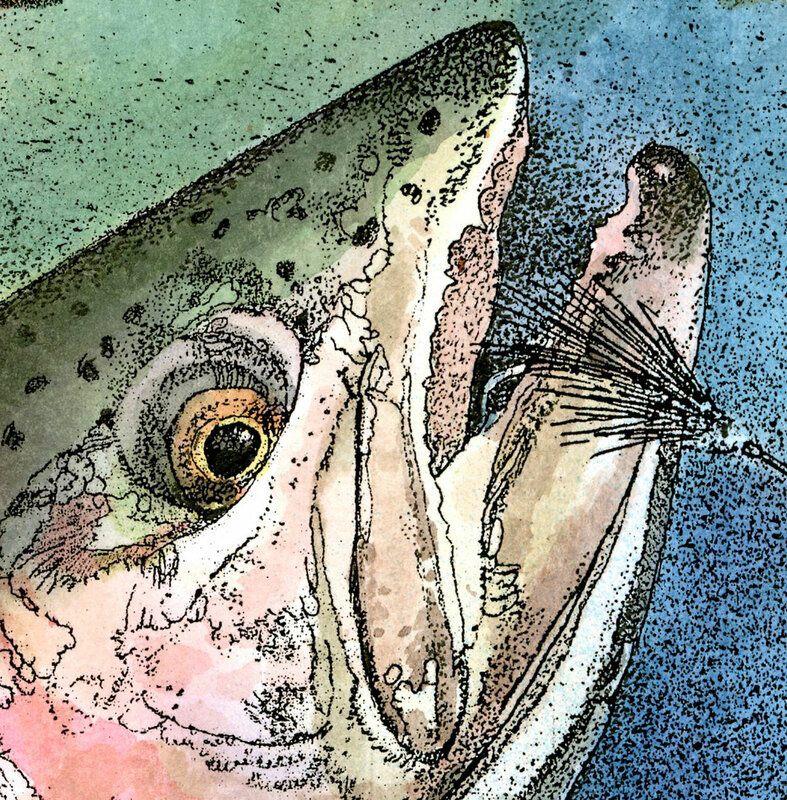 The size of the Trout head in the finished illustration is 2″x2″. The illustration was created traditionally with pen and in and watercolor on bond paper. This is one of four of a series of freshwater fish leaping out of the water . This was created in 2010. Pen and ink and liquid acrylic on bond paper. 10″ x 10″.